U.S.; General Issues, 1912, $1 Violet Brown Used on 2 Parcels, EKU, #423, first with pair, 2nd with strip of 3 (one damaged), tied on large cardboard piece, hs. 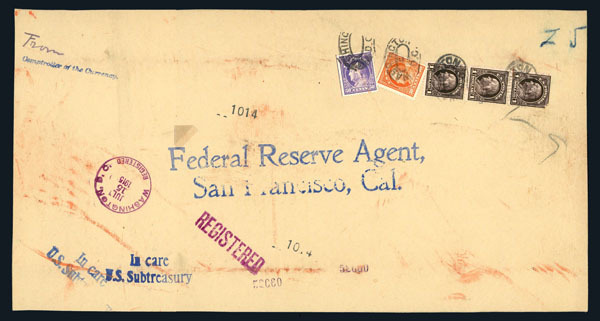 Federal Reserve Agent San Francisco, both from the Comptroller of the Currency, incl. additional adhesives, record #s 52025, 52060, fine and unusual, Fine or better. 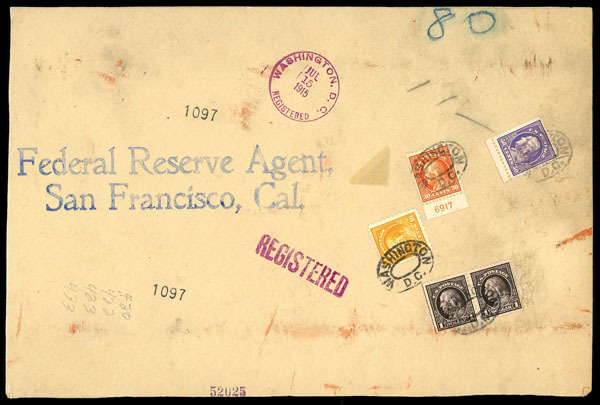 "Washington, D.C./Jul 15, 1915/ Registered" c.d.s., making these 2 the July 15, 1915 earliest documented usages along with several others.